All pets will need pain management at some time and Tripawds often need it more than their four-legged pals. Today on Tripawd Talk Radio we learn how veterinary acupuncture can help our threee-legged pets feel better throughout their lives. Is it possible to exercise Tripawd cats? 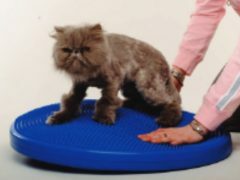 Our members say “Yes!” These articles about core-strengthening for cats explain DIY exercises you can do together, and share more about feline rehabilitation therapy.